The Promax System is a gas boiler made and manufactured by Potterton, it is a condensing wall mounted boiler. It is a highly efficient model coming with a wide range of features and accessories to give you the most dependable boiler. 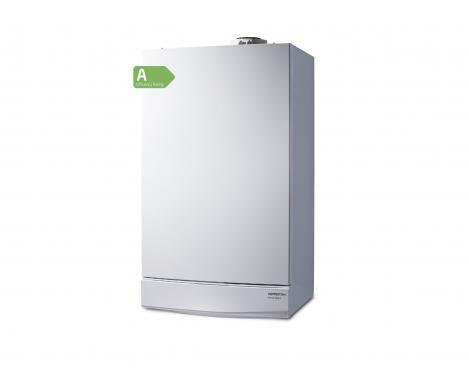 This boiler comes with an output rating of 32kW but is also available in outputs of 12kW, 15kW, 18kW, 24kW and 32kW, making this range perfect to fit any size of property. It has an efficiency rating of 89% making it an A rated boiler. The Promax is perfect for those homes with high hot water demands and is a fully modulating and highly efficient with a single box solution. This unit has been developed with robust hydraulic connections and offers reliability and quality of the boiler as standard, with it being in the NOx class 5. It has flueing options of up to 20m, helping to offer flexibility of the boiler placement for just about any home. It also features a pre-plumbing jig, helping to save time on installation. This unit is compatible with the Megaflo Eco solar cylinder and Santon Premier Plus solar cylinder helping to make the model even more reliable than it already is when used in conjunction with each other. This unit also comes with 2 years warranty to give you peace of mind that you have bought a dependable boiler.